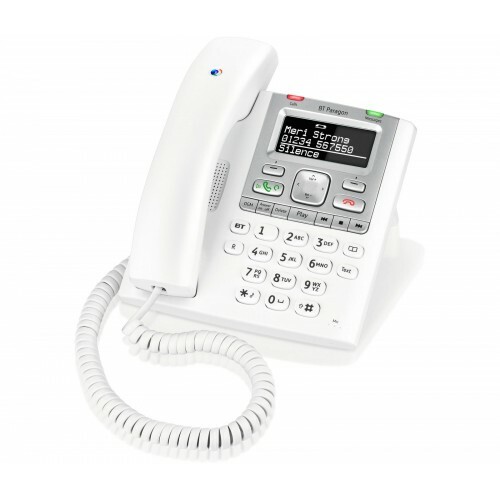 This corded telephone provides a built-in answering machine holding up to 16 minutes of call recordings and a phonebook providing space for up to 100 entries. The phone uses non-volatile memory so that you will not lose your recorded calls or phonebook entries in the event of a power failure. It also allows you to easily customize your outgoing message options, display caller phone numbers and record up to 30 caller numbers (including those who did not leave messages). A headset port is also provided for hands-free communication with either a headset or using the built-in speakerphone. The BT Paragon 550 provides an innovative memo feature allowing users to record reminders so that they don't forget to make an important call. This reminders are stored as unread messages. Additionally, a calculator is provided along with an appointment calendar, both of which may be accessed while making a live call so that you'll always be able to make calculations and add important events to your calendar without interrupting the call. 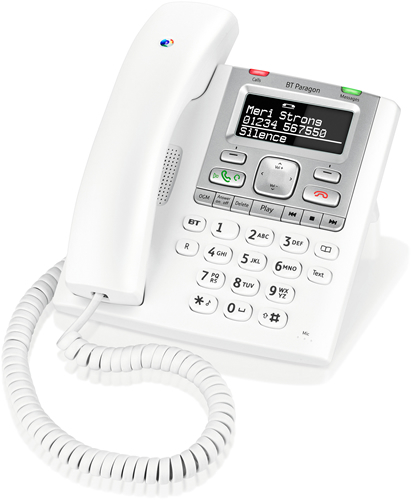 The BT Paragon 550 provides a three-line display screen which can display the last 10 numbers called for quick redialling and the last 30 numbers which called you. Configuring the phone is also easier than ever thanks to the included screen and straightforward set of buttons. Why Should You Buy this Answer Machine Phone? Ideal for home use, this phone presents a basic range of features for those who are budget-conscious and require something which is easy to use. Overall the BT Paragon 550 is a splendid phone. It functions perfectly well, was fairly straightforward to set up, and the volume is reasonably loud and clear. My only quibble is with the godawful ringtones, and was on the verge of sending the thing back if hadn't managed to find one 'normal' sounding ring. Service from ligo was faultless! Does everything I wanted. Absolutely delighted. A neat easy to use product. The layout of the buttons is well thought out, and the illumination of them when in use keeps the user informed of what is going on. It is an impressive unit for the price.